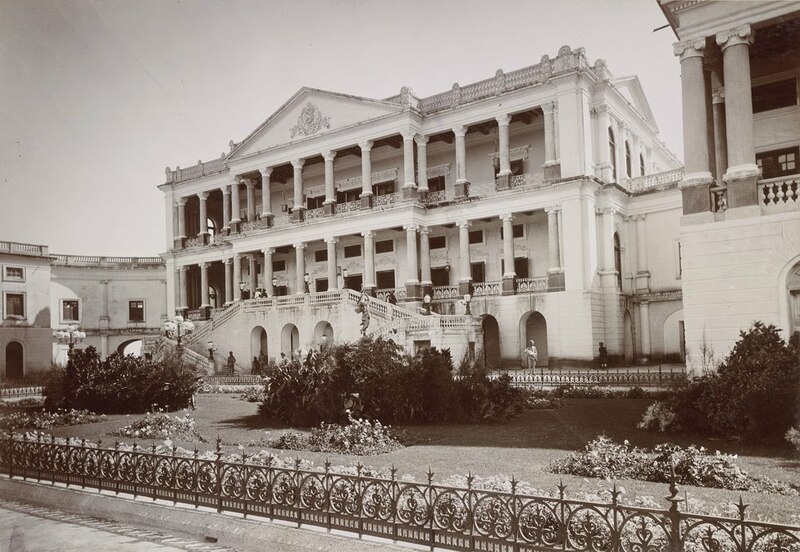 Photograph of the Falaknuma Palace, Hyderabad taken by an unknown photographer in the 1900s. The photograph is from an album containing views of various locations in India, formerly in the collection of Horatio Kitchener, 1st Earl Kitchener of Khartoum and Broome, (1850-1916), who was Commander in Chief of India between 1902 and 1909. Falaknuma literally means Mirror of the Sky. The palace was designed in 1872 by an English architect as the private residence of a rich Muslim grandee but in 1897 was purchased for use as a guest house by the Nizam. The front facade is in Palladian style, while the rear building, the Zenana is in Indo-saracenic style. The interior is equally opulent containing a marble entrance hall with an Italian staircase and a fountain. King George V and Queen Mary stayed here in 1906 and electric lights were installed for the visit of the Prince of Wales in 1926.